The Southeast is ruled by Venus, the planet of love and beauty which represents our sense of harmony, passion and enjoyment. On the material level, Venus stands for sexuality, wealth and beauty, while on a inner level it represents devotion to truth and it mainly affects women, children and the second son within your home. This area is well suited for a kitchen, since the creative energies of cooking are complemented by the Venetian influence . In the home, it is a good idea to keep this area clean, tidy, and you may place diamonds, artifacts or images depicting qualities of Venus. You can use the colours of the rainbow, turquoise and silver, as well as extract colours from this Yantra above for choice of decor. In the workplace, it is a good place to manufacture goods or operate machinery and heating or lighting systems. If you can refrain from storing sell by date food or fresh food on the Southeast point of your home or kitchen, this would give it a longer life, however storage of cooking oils is fine providing the climate is not too hot. Agni, the celestial deity in charge of fire element pervades this area, therefore in order to avoid a clash of elements, water is also not stored on or near this point. Weak Vastu in this area may lead your business to have drawn out transactions and slumping of stocks and investments. In terms of your health , eye infections, kidney and reproductive problems as well as lethargy may manifest. 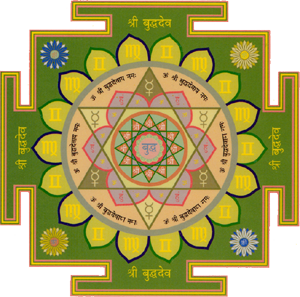 Whilst chanting the Parashuram mantra you can place this Yantra, on a Friday, in the Southeast point of your home or workplace thus nullifying any Vastu discrepancies on the energetic and karmic levels and thereby create a space where you can get in touch with the higher qualities of Venus. 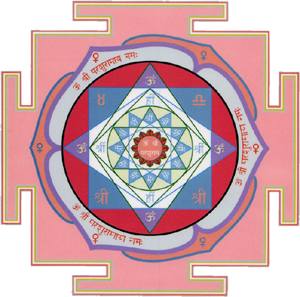 Any severe spatial deficits can be further transformed and harmonised with the installation of the Vastu pyramid in the centre of your property or on the Southeast point and it will work in conjunction with the Parashuram yantra on your wall. Strong Vastu in this area leads to fulfillment of your desires, popularity, generosity and emotional control as well as supporting good energy levels for all residents of the house. It enhances loving relationships, friendly interactions and awards comfort, luxury and sensuality, creating a space in which to have fun, love and more joy in your life.